We are a specialist provider of bespoke training programmes that help organisations become leaner, more compliant and more progressive. For over 25 years, we’ve brought the latest thinking, the leading techniques and the most experienced industry experts into ambitious organisations, large and small, throughout Ireland, the UK and beyond. Our programmes are renowned for their dynamic, practical, real world approach and are built on a foundation of theory and practice that works. That’s why the likes of CRH, eBay, Glanbia, Kerry Group, Medtronic, Musgraves and Pepsi trust us to train their people – over 65,000 in 27 years. As well as In-House programmes we run public courses in Dublin and around the country. Dave & Siobhán are responsible for the overall management of the organisation and ensuring that the dynamic team in SQT continue to design and deliver training programmes that are relevant, practical and always have the needs of the customer, both the learner and the organization, in mind. Dave joined SQT in 2016 having over 20 years’ experience in Engineering and Supply Chain within a number of multinationals including DCA, Rand McNally, McQueen, Microsoft & Dell. He has held a number of global roles including Quality, NPI, Logistics, Manufacturing, Engineering and IT. Siobhán joined SQT in 2001 following a 17 year career working at senior management level across many organisations. Having worked in multinational organisations such as Dell, Rand McNally, Sykes Corporation, McQueen, DCA and Wang Laboratories; her experience spans management roles in Operations, Quality, Engineering, Project Management, Marketing, Call Centre & Service Logistics. Siobhán is responsible for the overall management of the organisation and ensuring that the dynamic team in SQT continue to design and deliver training programmes that are relevant, practical and always have the needs of the customer in mind. Lorraine joined the team at SQT in 2013. A BSc (Hons) in Applied Computing and MSc in Information Systems, her previous roles include Head of Learning & Innovation at ICHAS, Academic & Quality Manager at HSI Limerick Business School, HETAC Institutional Review Project Manager at St Patrick’s College Thurles and Lecturer & Research Supervisor in Management in Education at Waterford Institute of Technology. Lorraine brings great academic insight and governance to the SQT team. Her career to date also includes many lecturing roles at Waterford and Tralee Institutes of Technology. These combined roles have provided an insight into all aspects of training and education which she brings with enthusiasm to her role in SQT. Aishling has been part of the SQT team since 2001. Her current role is Marketing Project Manager; managing the SQT Website, Prospectus, Course Brochures and lots of other related course materials. She is also responsible for major Tenders, of which we get quite a lot throughout the year. To this she brings all the experience and knowledge from her previous role as Senior Course Manager, managing both In-House and Public customer course requirements. Prior to SQT, she worked in Diageo and ESI (Energy Services International). Aishling has a BBS (Hons) – Marketing, as well as a Diploma in Marketing, Advertising and PR. Jean joined the team in 2011. A B.Comm graduate from NUI Galway and MSc in Corporate Strategy, Jean manages our suite of Lean Six Sigma programmes and assists many organisations with large scale programme roll-outs. Coming from a strong customer service background, she is committed to delivering exceptional standards of customer care having previously worked as an SME Account Manager for Telefonica O2. Jean has a strong aptitude for organising, planning and multi-tasking and so combining these skills with her creative talents, she also manages all email marketing activity, keeping customers regularly updated on SQT training events. Lisa joined the SQT team in 2003 and is currently In-House Course Manager. Lisa came to SQT from Genworth Financial where she gained a wealth of customer service experience. Over the years Lisa has assisted many companies across a wide range of sectors in rolling out their training initiatives smoothly and efficiently. Karen joined SQT in 2013 as our Public/In-House Course Manager. Her job is to help organisations and individuals identify the most appropriate training programme to meet their need. Karen has over 20 years Order Management, Logistics, Customer Service and Project Management experience working within the healthcare, software and call centre sectors in companies such as Chattem Global, Orlogix Software, Sykes Corp and McQueen. She has previously worked as a Customer Service Manager, Project Manager and Fulfilment Services Supervisor. With such vast experience and knowledge, Karen is extremely customer focused and always willing to help. Bernie joined SQT in 2014 as Public Course Manager and Accreditation Officer. She provides support to Learners and Tutors on all aspects of accreditation and is the contact for all NEBOSH and public course enquiries. Bernie comes from a financial and customer service background, previously working for GE Money and Britvic Ireland with over 12 years’ experience. Bernie is a real people person (and a great story teller) and enjoys building strong relationships with customers. Eilish is part of the SQT Team since the very early days having come on board in 1989 and so brings to her present roll as Accreditation/Systems Manager many, many years of excellent customer and course management experience. 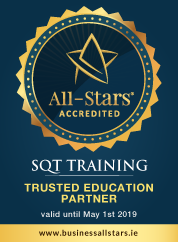 As SQT offer a wide range of accredited programmes, Eilish and Bernie ensure all programmes and learners are managed through the accreditation process smoothly. Kim joined the SQT team in 2006. A B.Comm graduate from NUI Galway she is our Accounts Manager and the person who keeps everyone happy. She previously worked in Accounting functions within Kerry Foods and Cara Craft and so brings to her role lots of great technical knowledge and organisational skills. Frances has been with SQT since it’s early days in the Dromineer Bay Hotel. She is our Materials Manager and competently manages the whole process of getting training materials from the development stage with our tutors, through to delivery of comprehensive course manuals on site, in every training location, exactly when required. Considering we train in excess of 6500 people annually in locations from Cork to Belfast, Denmark to Poland, this is no simple task which is why we call her “Frances the Great”. Margie joined SQT in 2006 as Office Administrator bringing with her over 20 years’ experience from Hi-Tech Precision Engineering. Together, Margie & Frances operate a “zero error philosophy” to ensure all Training kits are printed, delivered and perfect, for every training event.